If you have a conversation with someone from the Greatest Generation (those who experienced WWI during their adult lives), they may talk about the cost of living during the middle of the 20th century. That is, during a time when a loaf of bread cost less than 15 cents, and you could buy a box of shredded wheat for less than 20 cents. And, as we listen with envy to these stories about days that have long since past, we may think about just how much we could have bought if we earned our salaries of today back then. We as a society often complain about the cost of living these days. Whether it’s for housing, food, automobiles, gas, insurance, college, or medical care, we’re constantly dealing with high costs. Therefore, it’s intriguing to hear about times when a dollar could stretch much further, and places where we could buy a mansion for a mid-level salary. Americans are certainly not the only ones who face high living costs. And surprisingly, the most expensive places to live are not even located in the United States. 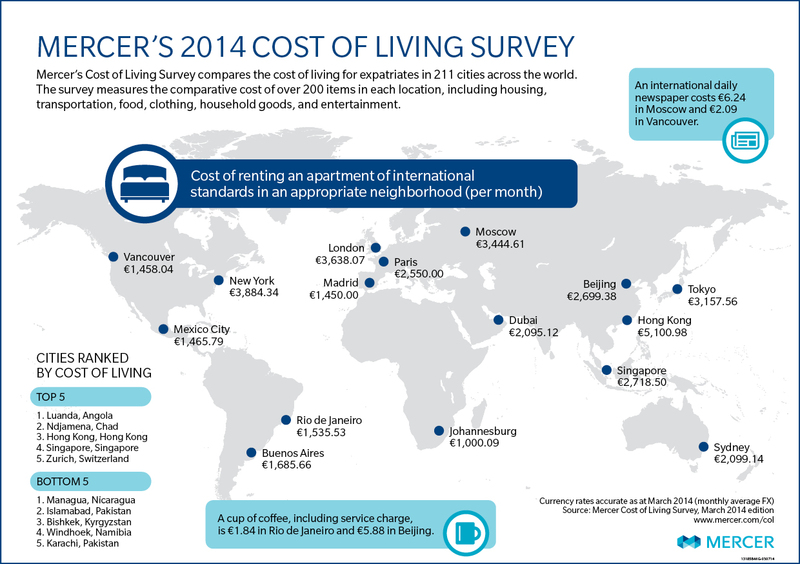 Using Mercer’s 2014 Cost of Living Rankings, we’ve created a list of the most expensive places in the entire world. Mercer takes into account over 200 items for each location, including food, housing, transportation, clothing, and household goods. Based on this data, coupled with pricing information from Expatistan, these are the most expensive cities to live across the world.